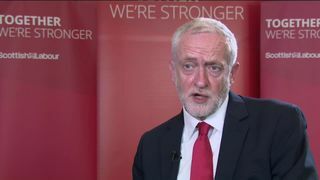 Jeremy Corbyn has hit back at Benjamin Netanyahu after the Israeli prime minister criticised him for attending a Palestinian wreath-laying ceremony. Mr Netanyahu tweeted: "The laying of a wreath by Jeremy Corbyn on the graves of the terrorist who perpetrated the Munich Massacre and his comparison of Israel to the Nazis deserves unequivocal condemnation from everyone - left right and everything in between. "Mr Corbyn replied that the leader's claims were "false". "What deserves unequivocal condemnation is the killing of over 160 Palestinian protesters in Gaza by Israeli forces since March, including dozens of children," he tweeted.He also criticised the nation state law recently introduced in Israel, saying: "I stand with the tens of thousands of Arab and Jewish citizens of Israel demonstrating for equal rights at the weekend in Tel Aviv." Israeli PM @Netanyahu's claims about my actions and words are false. The intervention comes in the middle of a row over the role of Mr Corbyn in a wreath-laying memorial for Palestinians accused of being behind the murder of Israeli Olympic athletes at the Munich Olympics in 1972.Mr Corbyn says he took part in a ceremony for 47 people killed in a 1985 Israeli bombing in Tunisia four years ago. While he admitted being present during a wreath-laying for those allegedly involved in the Munich massacre, he said he was not directly involved.A spokesperson said on Monday that the Labour leader did not lay a wreath at the graves of "those alleged to have been linked to the Black September organisation or the 1972 Munich killings".The spokesperson said: "As has been consistently stated, Jeremy Corbyn visited the Palestine National Cemetery in Tunisia to support Palestinian rights and honour the victims of the illegal 1985 airstrike, many of whom were civilians, on the PLO's headquarters - an attack condemned by the UN." Mr Netanyahu's second claim is likely tied to a 2013 video that emerged last week, in which Mr Corbyn said occupation of the Palestinian West Bank was "of the very sort that would be recognised by many people in Europe who suffered occupation during the Second World War".Speaking on the wreath laying after the photos emerged, Mr Corbyn said he was there because he "wanted to see a fitting memorial to everyone who has died in every terrorist incident everywhere". "Because we have to end it. You cannot pursue peace through a cycle of violence. The only way you pursue peace is a cycle of dialogue," he said. Labour MP Luciana Berger also commented on the incident tweeting: "Being 'present' is the same as being involved. When I attend a memorial, my presence alone, whether I lay a wreath or not, demonstrates my association and support. "There can also never be a 'fitting memorial' for terrorists. Where is the apology?"